Thanks to Chris Stapleton, the song has experienced an insane amount of success since late 2015. But its history extends back much further than that. “Tennessee Whiskey” was originally recorded by David Allan Coe, but first gained popularity when George Jones released his version in 1983. Jones managed to snag the top spot on the chart in Canada and reached the second spot on the Billboard chart in the U.S.
Who ever would have thought that “Tennessee Whiskey” would come back into the spotlight 32 years after Jones released his recording? But that’s exactly what happened when Stapleton performed his rendition of the song at the 2015 CMA Awards along with Justin Timberlake. Stapleton’s version was an instant hit, and claimed the number one spot on the Billboard Hot Country Songs chart. Although it has been a while since that performance, “Tennessee Whiskey” is still one of the hottest songs in country music. s a result, it’s a fan-favorite song to cover. We’ve heard some outstanding covers of the tune before, from Kris Jones‘ viral cover to American Idol winner Trent Harmon‘s show-stopping performance. But we bet y’all have never seen a “Tennessee Whiskey” cover like this. Performed by a group of siblings called T5, this cover of “Tennessee Whiskey” features some impressive harmonies and outstanding talent. 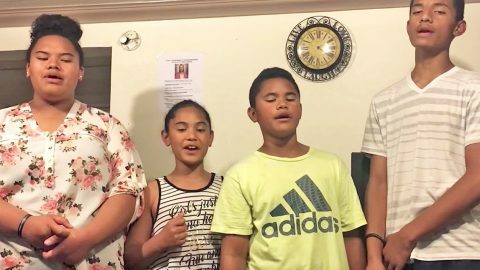 Three of the siblings sing harmony while the youngest brother takes the lead on the song. When he starts singing you’ll be blown away by just how strong and soulful his voice is. It takes some people years to gain solid control of their voice, but this young man has it down pat! This cover of “Tennessee Whiskey” has to be one of the best out there right now. You don’t want to miss out on this! Check it out in the video below. We see a bright future ahead for these four talented siblings!